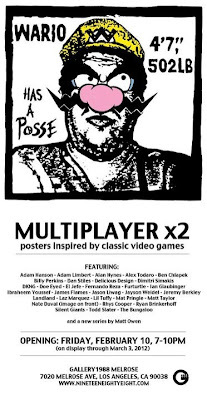 In January I was asked to design and illustrate a new print for LA based Gallery 1988's latest exhibition 'Mulitplayer II' inspired by old school video games. It was a bit of a challenge turning around some artwork, screen-printing them and shipping them to the States in the space of a couple of weeks but the prints arrived yesterday for the opening tonight. Phew. The previous 'Multiplayer' exhibition featured Daniel Danger, Drew Millward, Kevin Tong, Rich Kelly and Scott Campbell - basically all of my favourite illustrators so when I was asked I was stoked. This year is no different with artwork from the likes of Olly Moss, Matt Taylor, Rhys Cooper and the Silent Giants so if you're about in LA try and get along.